Vancouver is a coastal seaport city on the mainland of British Columbia, Canada. According to the 2011 census, it is the eighth largest Canadian municipality. Vancouver is one of the most ethnically and linguistically diverse cities in Canada; 52% of its residents have a first language other than English. 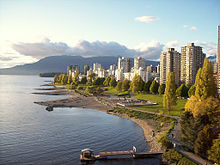 The Greater Vancouver area of around 2.4 million inhabitants is the third most populous metropolitan area in the country and the most populous in Western Canada. Vancouver is the most densely populated Canadian municipality, and the fourth most densely populated city over 250,000 residents in North America, behind New York City, San Francisco, and Mexico City. A. N. Homer, The Imperial Highway (1912), p. 84. Anita Zabludowicz The richest people in travel. This page was last edited on 28 September 2017, at 10:40.